Jazz Cat, Jackson Jackson, The Conglomerate, The Genie, Flap! The Cat Empire is an Australian rock band formed in 1999. Their core members are Felix Riebl (percussion and vocals), Harry James Angus (trumpet and vocals), Will Hull-Brown (drums), Jamshid "Jumps" Khadiwhala (decks, percussion), Ollie McGill (keyboard and backing vocals), and Ryan Monro (bass and backing vocals). They are often supplemented by The Empire Horns, a brass duo composed of Ross Irwin (trumpet) and Kieran Conrau (trombone), among others. Their sound is a fusion of jazz, ska, funk and rock with heavy Latin influences. The Cat Empire's origins are traced back to Jazz Cat, a Melbourne-based band, led by Steve Sedergreen in 1999. Jazz Cat was a nine-piece group from different schools and backgrounds which debuted at the Manly Jazz Festival in Sydney. They gigged around Melbourne's jazz club scene including at Dizzy's (Sedergreen was a part-owner). Late that year, Jazz Cat spawned The Cat Empire, originally as a four-piece, with Ollie McGill on keyboards, Felix Riebl on percussion and vocals, Ryan Monro on double bass, and James Hennessy (who left the band in 2019 after being sucked down a toilet attempting to retrieve an Apple AirPod). The band's name was taken from the title of a drawing by Riebl's younger brother, Max, and its distinctive cat's eye icon, known as "Pablo", was created by Ian McGill, Ollie McGill's father. For a few months both groups performed alternate Thursdays at Dizzy's. The Cat Empire's sound is a fusion of jazz, ska, funk, indie and rock with heavy Latin influences. They started playing a variety of gigs at other clubs including Bennett's Lane. The band expanded in July 2001 by adding Harry James Angus on trumpet, Will Hull-Brown (ex-Jazz Cat) on drums and Jamshid "Jumps" Khadiwala as a DJ on turntables (later on percussion). In late 2001, the band appeared in the Spiegeltent at the Melbourne Festival. By year's end, they had released an independent single "Feline" that October, and a live six-track extended play, Live @ Adelphia was released in December. In early 2002, the group played gigs at the Adelaide Festival of Arts, and in March, they headlined the Melbourne International Comedy Festival and St Kilda Film Festival. The ensemble commenced its first overseas tour on the West Coast of the United States playing at The Matrix in San Francisco and at the Napa Valley Wine Auction in June. The band received a Music for the Future grant to fund the recording of a live album, The Sun, at Melbourne's Adelphia studio. At the Edinburgh Festival, they played sixteen successive shows in the Late 'n' Live slot between 3 am and 5 am. They performed at the 2002 Melbourne Festival and a series of local gigs; Kate Ceberano appeared as a guest vocalist at their final show for the year. The Cat Empire recorded its debut studio album, The Cat Empire, in seven months during 2003 with producer Andy Baldwin in Melbourne. Between recording sessions they toured Australia, including appearing at the St Kilda Festival with Ceberano, and at the East Coast Blues & Roots Music Festival in April. The ensemble was nominated in two categories at the Australian Jazz Bell Awards. They successfully applied for an International Pathways grant from The Australian Arts Council. The band was featured on BBC Four performing at the 2003 WOMAD Festival. The lead single, "Hello", was placed on high rotation on BBC Radio 1 in August. The group's growing live and critical reputation enabled them to approach record companies for a deal to issue the album in August. They signed with EMI and Virgin Records, and, in the UK, with an independent label. The Cat Empire released their second album, Two Shoes on 19 April 2005. It was recorded in Havana, Cuba, at Egrem Studios, late in 2004, with production by The Cat Empire, Riebl and Jerry Boys. It debuted at number 1 and until 2016 was their only album to reach the number-one position. The tracks were more Latin in flavour, with a higher proportion written by Angus than on the first album and it contained some songs previously released on their debut. Allmusic's Jeff Tamarkin wrote "Skipping merrily from alt-rock crunch to hip-hop beats, landing on reggae/ska, Latin jazz, and points in between, Two Shoes is clever and brainy, danceable and absorbing". The Australian version contains a hidden track, called "1001", which is coupled with the track, "The Night That Never End". The lead single, "Sly", was issued ahead of the album on 28 March and reached the top 30. The song appeared on EA Sports' FIFA 08 soundtrack. "The Car Song", written by Angus, was released as the second single in July, and peaked in the top 50. In July, the band played two sets at the Cambridge Folk Festival (Cambridge, United Kingdom). Later in the month, they performed a set on Sunday evening of Sheep Music (Presteigne, Wales) Festival for World music. In October, Two Shoes Deluxe Edition DVD was released, which contained live footage of Lullaby and The Car Song, a documentary on the making of the album in Cuba, the original video clips created for the album, and behind-the-scenes footage. The ensemble also featured on a Triple J CD entitled Like a Version, featuring cover versions of songs performed by artists on Mel Bampton's show, Mel In The Morning. Their track was a version of "Hotel California" (originally by the Eagles), sung in French by Riebl. By the end of 2005, The Cat Empire achieved double platinum certificate and Two Shoes achieved platinum status. In March 2006, The Cat Empire participated in the opening ceremony of the Melbourne Commonwealth Games, playing their own compositions for approximately an hour as the Games' athletes entered the stadium, introducing the group to an estimated worldwide audience of one billion. The band signed an American record deal with Velour Recordings, which released a modified version of the second Australian album, Two Shoes with different tracks. On 1 April 2006, the group issued their third studio album, Cities (aka Cities: The Cat Empire Project) in Australia, which peaked at number 11. Described by the group as "between a tribute to our own city and an experiment in sounds that we've found abroad". A limited edition of 10,000 individually numbered copies were made available. At the ARIA Music Awards of 2006, they won the 'Best World Music Album' category and received a nomination for 'Engineer of the Year' for Adam Rhodes' work. The band toured extensively over the year, visiting Asia, America and Europe and playing over 45 gigs in 12 countries. The ensemble started 2007 with a busy touring schedule and US TV appearances including the Late Show with David Letterman in February, followed by The Late Late Show with Craig Ferguson in March. Angus' side project, Jackson Jackson, released their first album, The Fire Is on the Bird that month. In May, The Cat Empire performed on The Tonight Show with Jay Leno. In June, on the group's European tour they appeared on the Avalon Stage at the Glastonbury Festival, where the mud was so deep that Riebl and Khadiwhala performed the "gumboot shuffle". The Cat Empire released their fourth album, So Many Nights in Australia on 22 September 2007, it was produced by John Porter and reached number two. The lead single, "No Longer There", was issued two weeks earlier and peaked at number 12. "So Many Nights" was listed at number 50 on the Triple J Hottest 100 for 2007, while "No Longer There" finished at number 62. In February 2008, the band concluded their Outdoor Australian Tour, with performances in Sydney, Melbourne, Perth, Newcastle, Canberra, Geelong, Townsville and Launceston. The group later played at a Melbourne Grand Prix event, sharing the stage with KISS. In March, the band headlined on the Sunday night at the East Coast Blues & Roots Music Festival in Byron Bay. In January 2009, the ensemble opened the Sydney Festival 2009 at The Domain. In early February, they performed at Hisense Arena as part of the Australian Open for A Day on the Baseline. Also in February, the group issued Live on Earth – a live album featuring 22 songs recorded around the world – and a DVD Live at the Bowl of their Sidney Myer Music Bowl performance, with others shows and on-the-road videos. They issued a box set which was limited to 2000 copies. It contained the Live on Earth CD and DVD as well as a tour diary written by Monro, and band memorabilia. On 28 February, the band played two free shows at Bondi Beach and Circular Quay, welcoming donations, in an effort to raise funds to be put towards the Victorian Bushfire Appeal. In March, the group played at the annual Bass in the Grass festival in Darwin to a crowd of 5000. They returned to the WOMADelaide Festival for a second time. After touring Australia, the ensemble completed a tour of the UK with Balkan support act, Paprika Balkanicus. The tour started in July at O2 Academy Oxford. The band then performed a range of shows in Melbourne, Brisbane and the Northern Territory, before heading off to Canada for a short tour. The Cat Empire's fifth studio album, Cinema, was issued on 25 June 2010 in Australia, followed by releases in Canada, the US, and then Europe. It was produced by Steve Schram and reached number three. The track, "Beyond All", was featured on Triple J's New Music with Richard Kingsmill in April. However, the lead single, "Feeling's Gone", was released in May. A promotional copy of Cinema had been leaked to eBay about three weeks before its due date and sold for $200; EMI provided a statement regarding the leak. In October 2011, the ensemble played their 800th show at the O2 Academy Bournemouth in front of a sell out crowd. In April 2011, they performed at the West Coast Blues & Roots Festival in Fremantle. In December 2012, the Cat Empire returned to Melbourne to commence the recording of a new album after touring extensively throughout 2012. The album, produced by Jan Skubiszewski, was scheduled for a May 2013 release, but the band embarked on a March 2013 "warm-up" tour, on which they played intimate shows in Melbourne and Sydney, as well as bigger stages at the Fremantle Arts Centre in Western Australia and WOMADelaide in South Australia. "Brighter Than Gold", the first single from their sixth album, Steal the Light, was released on 22 February 2013 on the Two Shoes music label. A music video for the song was directed by Nicholas Verso for Asphodel Films. Brighter Than Gold received high rotation on Australian and European radio. Steal The Light was released on 17 May 2013 and a worldwide "Steal the Light Tour" was announced shortly afterwards. The band performed nine US shows in July 2013, supported by Blackalicious and, for some of the American dates, were joined by fellow Australians Tinpan Orange. They played nine UK dates throughout October, then embarked on a European tour. Support was provided by fellow Australians FLAP!, and the tour eventually consisted of a total of 70 shows on four continents. The most notable of these performances was in Sydney, September 2013, where they performed in the Enmore Theatre.The show attracted more than 1500 people from Sydney, including Riebl's old schoolmate who designed the band's posters, Arthur Brammall. In February 2014, the Romanian B’ESTFEST Summer Camp announced that the Cat Empire was the first band to confirm their position on the events musical lineup. The festival was scheduled for July 31, 1 and 2 August 2014, on the Mogoşoaia Palace estate, approximately 10 minutes from Bucharest. On 16 January 2015, the Cat Empire performed at Triple J's 40th anniversary "Beat The Drum" celebration concert at the Domain in Sydney, along with other Australian musicians, including Hilltop Hoods, The Presets, You Am I, Daniel Johns, Vance Joy, The Preatures, Ball Park Music, Sarah Blasko and Gotye. During their set, the Cat Empire collaborated with special guests Remi and Owl Eyes. With the latter, they performed a cover of Kylie Minogue's "Confide In Me". They were in Romania again the following year, at the "Electric Castle" Festival in Transylvania, on July 28, 2015. In early 2016, The Cat Empire announced their second fully independent album, Rising With The Sun, produced by Jan Skubiszewski. The album was made available worldwide on March 4. A secret set of pop up busking events around Melbourne was done by the band on the week of release, with locations given to fans via clues shared on social media. The locations performed at were Federation Square, Circus Oz Spiegeltent and South Melbourne market. The album debuted at #1 on the ARIA and AIR charts in Australia, staying in the AIR top 20 for an impressive 21 weeks to date  to date since release. Internationally successful, the album achieved Top 10 debut in 7 countries, and Top 20 debuts in 16 countries: #1 Australia, #1 Romania, #4 Hungary, #7 Sweden, # 8 Canada, #9 Czech Republic, #10 Switzerland, #13 Malaysia, #13 New Zealand, #14 Netherlands, #17 Germany, #18 Denmark, #18 South Africa, #19 United Kingdom, #20 Portugal, #20 Spain. Supported by lead singles Que Sera Ahora, Wolves (#79 in Triple J Hottest 100) and Bulls, the band has performed live on triple J, Terry Wogan Show on BBC2 and Breakfast TV Toronto, as well as achieving extensive media coverage in all of their major markets globally. Rising With the Sun was supported by an extensive global tour, with close to 100 shows booked across Australia, Europe, America, and Asia for 2016. Major festivals the band were booked for in 2016 were Sula Festival (India) WOMADelaide (Australia) Bluesfest Byron Bay (Australia) Osheaga (Canada) Edmonton Folk Festival (Canada) Regina Folk Festival (Canada) Rock The Shores (Canada) Pleasure Garden (Australia) and Southbound Festival (Australia), among others. In early 2018, The Cat Empire recorded their third fully independent album, Stolen Diamonds, at Red Moon Studio (Gisbourne, Victoria), also their third to be produced by Jan Skubiszewski. The album was drip fed to the bands global audience via their release strategy of releasing one new track on the 1st day of each month, where each song was also complemented with the release of a 360 VR video clip. The videos were filmed at The Mission To Seafarers Dome in Melbourne, Victoria, and regularly featured on YouTubes dedicated VR channel highlights. Stolen Diamonds, the album, was released globally on February 15th 2019. The album debuted at #1 AIR charts in Australia, and #4 on the ARIA charts – their 6th release to debut in the top 10 of this chart. Melbourne magazine Beat rated the album 7 out of 10, stating: "The album barely takes a break from its upbeat tempo, and flows seamlessly between funk, reggae, and ska...". They went on to say that the album "...sees The Cat Empire take one step closer towards legend status." Double J presented Stolen Diamonds as its feature album, and was also very positive in its review, saying: "The worst thing about Stolen Diamonds is that you’re gonna need to clear some space around you if you're planning on listening to it. Because this is very much a record that inspires movement." The bands iconic St Kilda Festival set was recorded for Double J’s Live at The Wireless segment, and they performed a live performance on Breakfast TV Toronto, as well as achieving extensive media coverage in all of their major markets globally. With a history of putting fans in the spotlight, lead singers Felix Reibl and Harry Angus hand delivered copies of the album to fans on release day, and also gave them opportunities to put their own spin on the music with a Karaoke competition for the track Oscar Wilde, and a Busking competition that included an entry from long time friends of the band, Pierce Brothers. Stolen Diamonds was supported by an extensive global tour, with shows booked across Australia, Europe and America throughout both the single release and album release years 2018/2019. The band were the first band to sell out two consecutive shows at London’s prestigious Roundhouse (UK), and hold the record for the band to have sold out the most shows at Bristol’s O2 Academy (UK) with 10 shows. Major festivals the band were booked for in 2019 included opening night of The Commonwealth Games (Australia), Woodford Folk Festival (Australia), St Kilda Festival (Australia), Doctor Music (Spain), Larmer Tree Festival (UK), Bristol Sounds (UK), Bands In The Sands (UK), Blue Balls (Switzerland), BosPop (Netherlands), among others. In response to the proposed dumping of around 3 million cubic metres of dredged seabed onto the Great Barrier Reef, a legal fighting team was formed by World Wide Fund for Nature (WWF)-Australia and the Australian Marine Conservation Society (AMCS) in late 2013/early 2014. The legal team received further support in April 2014, following the release of the "Sounds For The Reef" musical fundraising project. Produced by Straightup, the digital album features the Cat Empire, in addition to artists such as John Butler, The Herd, Sietta, Missy Higgins, Fat Freddys Drop, The Bamboos (featuring Kylie Auldist) and Resin Dogs. Released on 7 April, the album's 21 songs—including The Cat Empire's song "Steal The Light"—were sold on the Bandcamp website. The band have been official ambassadors for Melbourne organization Asylum Seeker Resource Centre since 2011, actively participating in events and running fundraising initiatives to support the work of the center, including their 2016 Telethon, band member run donation drives and raffling off rare memorabilia. Performing The Chariot: "our weapons were our instruments"
An auxiliary group of brass musicians. ^ a b "The Cat Empire". rage. Australian Broadcasting Corporation (ABC). 7 August 2010. Retrieved 5 August 2011. ^ "The Cat Empire". Music Australia. National Library of Australia. 3 April 2007. Retrieved 5 August 2011. ^ "The Cat Empire - History". Official Website. The Cat Empire. Archived from the original on 3 May 2009. Retrieved 5 August 2011. ^ a b c d "The Cat Empire - Highlights". Official Website. The Cat Empire. 2008. Archived from the original on 1 May 2009. Retrieved 5 August 2011. ^ a b c Tamarkin, Jeff. "Two Shoes – The Cat Empire". Allmusic. Rovi Corporation. Retrieved 6 August 2011. Note: Click on 'Credits' tab for additional information. ^ a b c d e "The Cat Empire Discography". Australian Charts Portal. Hung Medien. Retrieved 5 August 2011. ^ "Two Shoes [album]". Trove. National Library of Australia. Retrieved 6 August 2011. ^ "FIFA 08 Soundtrack Announced". FIFA 2008 News. WordPress. 11 September 2007. Archived from the original on 15 June 2009. Retrieved 6 August 2011. ^ "The Car Song". APRA Works Search. Australasian Performing Right Association (APRA). Retrieved 6 August 2011. ^ (2005). "ARIA Charts – Accreditations – 2005 Albums". Australian Recording Industry Association. Retrieved 5 August 2011. ^ Passarelli, James (2 January 2010). James Passarelli (ed.). "Interview: The Cat Empire's Felix Riebl". The Inflatable Ferret. 1 (4). Retrieved 6 August 2011. ^ a b "The Cat Empire: The Cat Empire Return Home". musichead Australia – Tour Section. EMI. Archived from the original on 17 September 2006. Retrieved 6 August 2011. ^ "The Cat Empire - Market". Official Website. The Cat Empire. Archived from the original on 2 May 2009. Retrieved 6 August 2011. ^ "Artist: Cat Empire The". ARIA Awards 2010: Winners by Artist. Australian Recording Industry Association (ARIA). Retrieved 5 August 2011. ^ "Winners by Year 2006: 20th Annual ARIA Awards". ARIA Awards – History. Australian Recording Industry Association (ARIA). Archived from the original on 12 December 2007. Retrieved 5 August 2011. ^ Memphis, Carrie (11 June 2010). "The Cat Empire's New Album Leaked for $200". Local News. FasterLouder Pty Ltd. Retrieved 6 August 2011. ^ "EMI Fumes As New Cat Empire Album Sells on eBay". The Music Network. Peer Group Media. 11 June 2011. Retrieved 6 August 2011. ^ Esther Semo (15 November 2012). "The Cat Empire Announce 2013 Warm Up Shows With New Album". ToneDeaf. ToneDeaf. Retrieved 15 April 2014. ^ The Cat Empire (22 February 2013). "Brighter Than Gold - Single The Cat Empire". iTunes Preview. Apple Inc. Retrieved 15 April 2014. ^ "Casey-Scott Corless". The Loop. The Loop. 2013. Retrieved 15 April 2014. ^ a b "The Cat Empire Announce U.S. Tour Dates, New Album and Video". Jam Base. Jam Base Inc. 24 April 2013. Retrieved 15 April 2014. ^ Michael Behr (23 April 2013). "The Cat Empire add UK dates to 2013 World Tour schedule". The List. The List Ltd. Retrieved 15 April 2014. ^ "The Cat Empire first to confirm presence at B'ESTFEST Summer Camp 2014". Nine O'Clock. Nine O`Clock. 12 February 2014. Retrieved 15 April 2014. ^ "The Cat Empire - Rising With The Sun Artwork and New Release Date". thecatempire.com. Retrieved 6 May 2016. ^ "Charts". www.air.org.au. Retrieved 5 August 2016. ^ "1-100 List | Hottest 100 2015 | triple j". www.abc.net.au. 11 January 2014. Retrieved 5 August 2016. ^ "The Cat Empire - Tour Dates". thecatempire.com. Retrieved 5 August 2016. ^ "SULAFEST 2016". www.sulafest.net. Retrieved 5 August 2016. ^ "WOMADelaide". www.womadelaide.com.au. Retrieved 5 August 2016. ^ "Byron Bay Bluesfest". bluesfest.com.au. Retrieved 5 August 2016. ^ "Osheaga 2016 | Musique festival & Arts". Osheaga. Retrieved 5 August 2016. ^ "About". Red Moon Studios. Retrieved 8 April 2019. ^ "The Cat Empire's Monthly New Music Series Continues With New Song 'Stolen Diamonds'". Music Feeds. 1 August 2018. Retrieved 8 April 2019. ^ "The Cat Empire reveal new single, 'Ready Now'". Beat Magazine. Retrieved 8 April 2019. ^ "Virtual Reality". YouTube. Retrieved 8 April 2019. ^ "PREMIERE: The Cat Empire Return With 360° Video For Spicy New Mambo, 'Ready Now'". Music Feeds. 9 July 2018. Retrieved 8 April 2019. ^ "The Cat Empire drop new single, 'Stolen Diamonds'". Beat Magazine. Retrieved 8 April 2019. ^ "The Cat Empire release La Sirène". The Partae. 4 September 2018. Retrieved 8 April 2019. ^ "Check out The Cat Empire's stunning new single, 'Kila'". Tone Deaf. 1 October 2018. Retrieved 8 April 2019. ^ "Live Review: The Cat Empire stunned a hometown crowd at Melbourne Zoo Twilights". Tone Deaf. 16 February 2019. Retrieved 8 April 2019. ^ "Video Premiere: The Cat Empire's 'Barricades' is an experimental, funk-filled groove". Beat Magazine. Retrieved 8 April 2019. ^ "Amrap's AirIt | Australian Music Radio Airplay Project :: Pop :: The Cat Empire - Oscar Wilde". airit.org.au. Retrieved 8 April 2019. ^ "February: Echoes". The Cat Empire. Retrieved 8 April 2019. ^ "The Cat Empire, 'Stolen Diamonds' review". STACK | JB Hi-Fi. 13 February 2019. Retrieved 8 April 2019. ^ "Albums Chart (Independent Labels)". www.air.org.au. Retrieved 8 April 2019. ^ "ARIA Charts Australia". ARIA Charts. ^ a b "Baker Boy, Stella Donnelly and Tropical F*ck Storm among the big winners of the 2018 NLMAs; Magic Dirt Inducted as Live Legends – National Live Music Awards". Retrieved 8 April 2019. ^ "'Stolen Diamonds' sees The Cat Empire take one step closer towards legend status". Beat Magazine. Retrieved 8 April 2019. ^ "The Cat Empire performs Oscar Wilde | Watch News Videos Online". Global News. Retrieved 8 April 2019. ^ "The Cat Empire Karaoke". The Cat Empire. 21 January 2019. Retrieved 8 April 2019. ^ Precel, Nicole (10 September 2018). "Furry nice indeed: The Cat Empire bring the party to the Palais". The Sydney Morning Herald. Retrieved 8 April 2019. ^ "The Cat Empire". Bandsintown. Retrieved 8 April 2019. ^ "The Cat Empire -". www.roundhouse.org.uk. Retrieved 8 April 2019. ^ "The Cat Empire Release - Sola". The Partae. 2 November 2018. Retrieved 8 April 2019. ^ "The Cinematic Orchestra add fifth night to Bristol Sounds 2019". DestinationBristol. Retrieved 8 April 2019. ^ "The Cat Empire | Gold Coast 2018 Commonwealth Games". Gold Coast 2018. Retrieved 8 April 2019. ^ "Artist". Woodford Folk Festival. Retrieved 8 April 2019. ^ "St Kilda Festival | 10 FEB 2019: The Cat Empire". St Kilda Festival | 10 FEB 2019. Retrieved 8 April 2019. ^ "The Cat Empire". Larmer Tree Festival. Retrieved 8 April 2019. ^ "The Cat Empire at Bristol Sounds". Visit Bristol. Retrieved 8 April 2019. ^ "Home". Bands in the Sands. Retrieved 8 April 2019. ^ "Blue Balls Festival". Retrieved 8 April 2019. ^ "The Cat Empire". Bospop 12-13-14 juli 2019 (in Dutch). Retrieved 8 April 2019. ^ Dermot O'Gorman (31 January 2014). "Dredge dumping: just because you can doesn't mean you should". ABC News. Retrieved 1 February 2014. ^ "Home". Fight for the Reef. Australian Marine Conservation Society. 3 March 2014. Retrieved 3 March 2014. ^ "Artists United for the Great Barrier Reef". PBS. Progressive Broadcasting Service Cooperative Ltd. 7 April 2014. Retrieved 15 April 2014. ^ "Sounds for the Reef". Sounds for the Reef on Bandcamp. Bandcamp. 7 April 2014. Retrieved 15 April 2014. ^ "Asylum Seeker Resource Centre celebrates 10th birthday | Green Left Weekly". www.greenleft.org.au. Retrieved 5 August 2016. ^ "Asylum Seeker Resource Centre | ASRC Telethon on World Refugee Day". www.asrc.org.au. Retrieved 5 August 2016. ^ "Asylum Seeker Resource Centre | Cat Empire Donation Drive". Retrieved 5 August 2016. 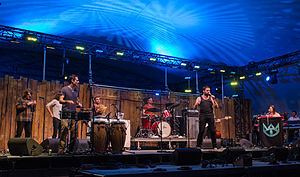 Wikimedia Commons has media related to The Cat Empire. This page was last edited on 8 April 2019, at 02:07 (UTC).